Man, that seems cheap. I mean both of these guys had state championship programs in place, and at least in Northwestern's case they were primed to make another run this year. I understand about furthering your career, but these guys are uprooting there families from what were pretty stable jobs as far as coaching goes, to take a chance at furthering the career path by going to Clemson. They have to be ALL IN to do that. I'm thrilled to have them for what is relatively cheap money. I know we will get more than our money's worth. I hope this works out for all parties involved. I wouldn't think that their HS coaching jobs was paying them 85 and 90 k a year, or did they? between teacher salary and booster club money. Kyle was making about 85k @ NW. I'm hearing USC and LSU offered him less than what he was makin @ NW. NW. Regardless both want to be college coaches and this is a stepping stone. If Clemson doesn't have an opening in 3 years they will have plenty of opportunities elsewhere. this is about coming home. He will get a few extra bucks I would assume. But Dabo, the moms want to see and talk to you, not your fill in's. It's In Dabo They Trust when they are getting those warm and fuzzy feeling when they are close to you. Don't get lazy and start losing moms with a fill in!!! who wouldn't take 85k to spend everyday in tiger town around tiger football? Pick me! Not qualified in the least....but I would do it for free. that would be outside their state approved contract/salary? Yes they can. This would just be there salary. I am sure they can receive camp money, bonuses, ect. camp money is received for high school coaches that help with camps like at Clemson/USC or when Bobby Bentley was here he ran a huge quarterback camp. All this would be outside of the salary. I was just about to raise the point that this is probably not their whole salary and they're probably also going to be paid for working camps. I did a little reading a while back on what the "volunteer assistant" coaches in college baseball do for money, and I found that they generally get paid out of camp revenues and equipment contracts, but it isn't very much money. Not sure. According to my roommate, their positions are classified as GAs. They cannot physically or verbally coach players only communicate and work with staff. Regardless, they should get a raise in the next 3-5 years if it all works out. Either move up or they will be called to coach somewhere else. They're good and in a good place. down the road. Dabo is bringing these along slowly and not throw them to the wolves. transition from inside the program than from outside. I make 7 figures (if you count the 2 on the right side of the decimal)!!! You must teach in SC. 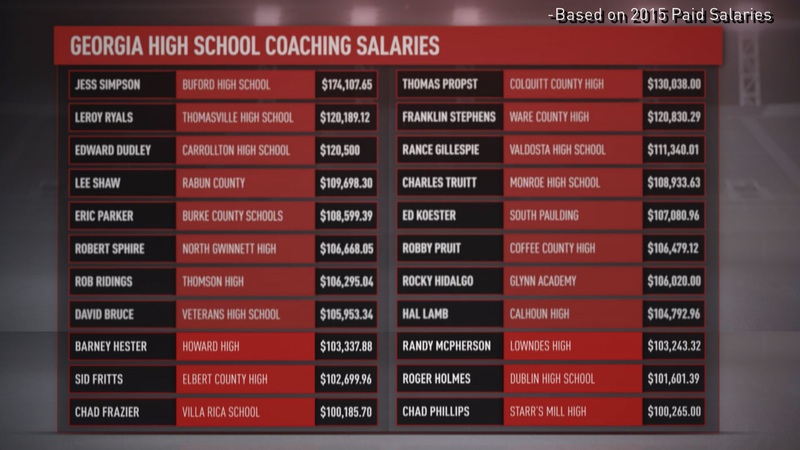 I'm pretty sure that's a pay cut for a Georgia teacherthat is also coach, assuming they've been teaching at least 10 years. years experience and coaching makes in Ga. Not even in the same town much less neighborhood. They pay you to goof off on TigerNet all day?